PUNE: In the last one month, egg prices in the country recorded a huge jump, soaring as much as 40 per cent while the prices of broiler chicken eased 25 per cent during the same time on account of 'added inventory'. Every year, egg prices witness a rise due to increase in demand during the winters. However, this year prices have moved up remarkably. "When vegetables turn costly, people switch to eggs, pushing up its rates as well. This is simple substitution effect," Raju Bhosale, executive member of the National Egg Coordination Committee (NECC) said. This year, the spike in egg prices is largely being attributed to the rise in prices of vegetables such as beans, cauliflower, cabbage, brinjal, etc. 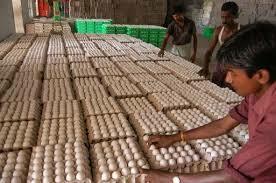 Hit by tight supply, egg prices have jumped to Rs 7-7.50 apiece in retail markets in most parts of the country, said Poultry Federation of India President Ramesh Khatri.